Okra (also known as Bhindi or Ladies Finger) is a nutritious vegetable. It is low in calories, has a high dietary fiber content and rich in potassium, vitamin B, C, calcium and folic acid. 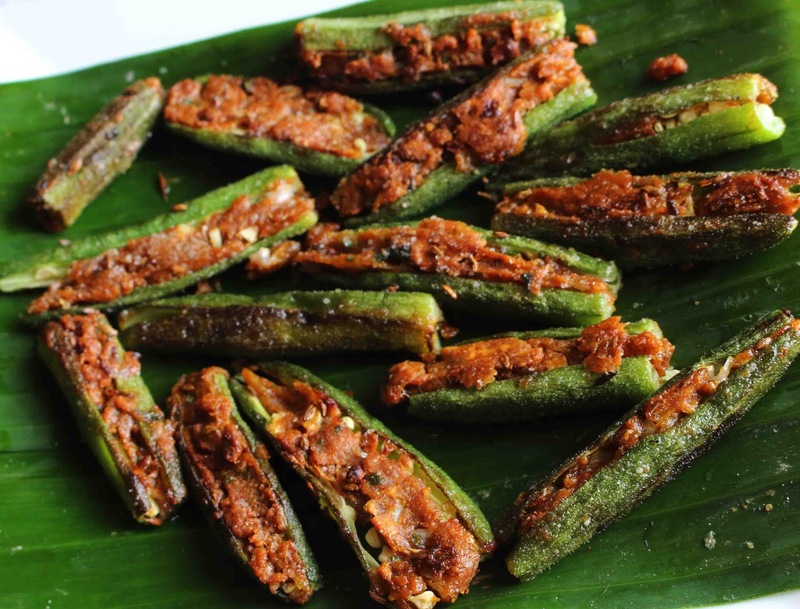 A simple and delicious dish, this fried stuffed bhindi has numerous regional variations with different spices or difference in cooking it. Irrespective of the variation, these stuffed ladies fingers can be served as a side dish to a meal or as a starter snack. Wash and dry the orkas, cut the tops and tails off. Slice them lengthwise into 2 or 3 pieces and keep aside. To a pan, add oil, onions, tomato, ginger garlic-green chilli paste and the required salt. Cook till the raw smell disappearsand then Allow them to cool. Place this masala in between the cut okras. Mix all the flours, turmeric powder, pepper powder and salt by adding the required water to form a batter of pouring consistency. Dip the stuffed okra pieces in the batter and fry them till golden brown. Tip: The Gujarati style Stuffed Bhindi uses Dry Mango Powder (Amchoor) and Corn Flour instead of the three flours used in this variation. Feel free to comment or share your thoughts on this Stuffed Okra Recipe from Awesome Cuisine.